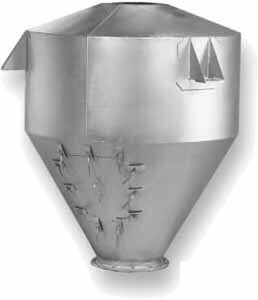 Scaling and Receiving Hoppers are used in pressure, vacuum and gravity scaling and receiving applications. These concentric and eccentric units are available in a wide range of capacities and are most often filled pneumatically through the use of a hopper fill valve. The eccentric hopper design is often used when the horizontal space above the fill point is limited.